Cured Pork Belly is Special! Yielding beautiful soft meat, this Pork Belly has a great twist of flavour. When cooking, roast at 180˚C in a covered dish for 90 mins. The result is a taste that is truly unique and memorable. 'Allowing Flavour to shine through'. 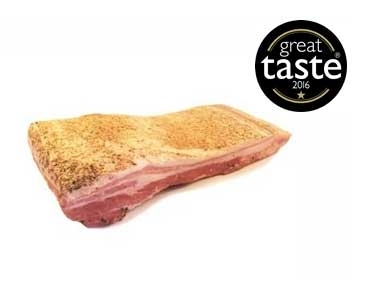 Having received a Great Taste Award, here's what the judges had to say: "Well spiced, flavoursome meat, tender and with sweet fat." "A good piece of belly - fat to meat content is very good. The fat gives flavour and succulence. The porkiness carries on and this would be good hot or cold. Juicy and succulent pork with a real depth of flavour"